Make-up artists who can provide evidence of their professional standing and who reside in a country in which the PRO CARD Loyalty Program is offered, can apply for membership. Application begins with registration on the Kryolan homepage. Following this submission you can apply online. Applicants can submit to Kryolan GmbH or to a co-issuer. Each person may apply for only one card. The make-up artist must completely fill out the application. The make-up artist making the application must submit, along with the application, proof of his or her professional status to the participating local PRO CARD participant. If the applicant cannot present such proof within eight weeks, the company will not issue the PRO CARD and cancel the application. In the case of non-entitlement, further claims may not be made. There is no legal right for participation in the PRO CARD Loyalty Program. Membership can be refused without the provision of reasons. The card may be used only by the individual PRO CARD member. It is not permitted to transfer the card to third parties. The PRO CARD can be used to purchase from worldwide PRO CARD participating companies. A card holder may use the card on a Kryolan online shop if available. 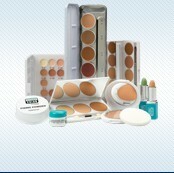 PRO CARD membership authorizes its holder for special make-up artist discounts in all participating stores. Discount entitlement may vary between countries. Pro Points are recorded in a reward account. A regularly updated Pro Point catalog shows the available bonus products that can be redeemed against Pro Points. The bonus products must be checked on availability before they can be redeemed. Points may not be exchanged for money. Pro Points lose their value after 3 years have elapsed. The PRO CARD is free of charges for the first year. Free membership extends automatically at the end of each year, if the holder has purchased products and/or services to the value of at least € 1000 / $ 1500 / £ 1000 during the previous year. If less is spent during one membership year, the holder may extend membership at the cost of € 30 / $ 40 / £ 25 or 1500 Pro Points per annum. The membership is valid for one year. If the holder can no longer satisfy the original conditions, the participating company has the right to cancel the card immediately. Kryolan GmbH furthermore reserves the right to cancel membership without notice, in cases of violations of conditions or of serious infractions. The PRO CARD remains the property of Kryolan GmbH and must be surrendered upon request to Kryolan GmbH or to the co-issuer. In the case of theft or loss of the PRO CARD, the holder must without delay report to the respective participating company in his or her country. This enables the card to be disabled and a new card to be issued. The parties are authorized to terminate the membership of a PRO CARD. The PRO CARD can be terminated at any time without provision of reasons or observance of notice periods. Kryolan GmbH cannot guarantee the actual granting of benefits from the participating companies. Kryolan GmbH reserves the right to make changes or additions to the PRO CARD program in the conditions of participation, the points, the scale of points, or any other procedures described in the program documents, insofar as such changes or additions are deemed necessary and insofar as participants are not disadvantaged against their good faith. Such changes or additions to the participation conditions will be announced in text form. Kryolan GmbH shall be responsible for issues in the sense of data privacy. Kryolan GmbH or third parties acting on its behalf shall record personal data on PRO CARD holders for the purposes of contractual authorization, execution, and termination. Promotional use of such data shall take place only for purposes of conducting the company‘s own advertising efforts (including recommendation advertising). Provision of data to third parties shall take place only insofar as necessary for fulfillment of the agreement. Any further use of personal data requires conformity to legal stipulations and the granting of permission. Any dispute arising out of or in connection with this agreement shall be settled by the court having jurisdiction in the city of Berlin, Germany. If individual terms of this agreement are ineffective and/or void, or become ineffective or void after execution of this agreement, this fact shall have no effect on the validity of the remaining provisions of this agreement. In the event of such ineffective and/or void stipulations, provisions shall go into effect in place of such stipulations, which come closest in effect to the commercial objectives that the parties to this agreement intended with their original ineffective and/or void stipulations. These provisions shall apply analogously in the event that gaps exist in the agreement.